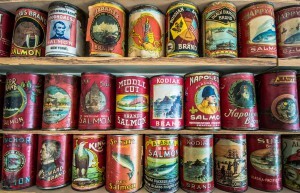 Historic cans from Alaska canneries. Photo courtesy of Karen Hofstad and Bruce Schactler. The Alaska’s Historic Canneries blog is hosted by the Alaska Historical Society and is a free, public resource for those interested in the history of our state’s canneries and fishing industry. It includes articles about historic Alaska canneries and related information. If you’re interested in posting something to the canneries blog, contact AHS board member, J, Pennelope Goforth at cybrrcat@gmail.com.